1. Slowly remove the old side sill protection tape. 2. Clean the body bonding surface with a shop towel dampened in isopropyl alcohol. After cleaning, keep oil, grease, and water from getting on the surface. 3. Remove the adhesive backing B from the side sill protection tape (C). NOTE: Do not remove adhesive backing A. 4. Align the corner (B) of the adhesive backing A with the body line (C). Then align the adhesive backing edge (D) with the body line (E). Press the exposed adhesive area of the side sill protection tape (F) against the body. 5. Remove the adhesive backing A from the side sill protection tape (B), and press the tape into place. NOTE: Do not remove the adhesive backing A. 4. Align the alignment marks (B) of the adhesive backing A with the body line (C). Then align the alignment mark (D) on the adhesive backing with the round body bulge (E). 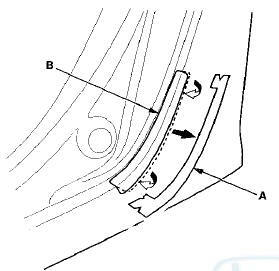 Press the exposed adhesive area of the side sill protection tape (F) against the body.